Hello everyone! 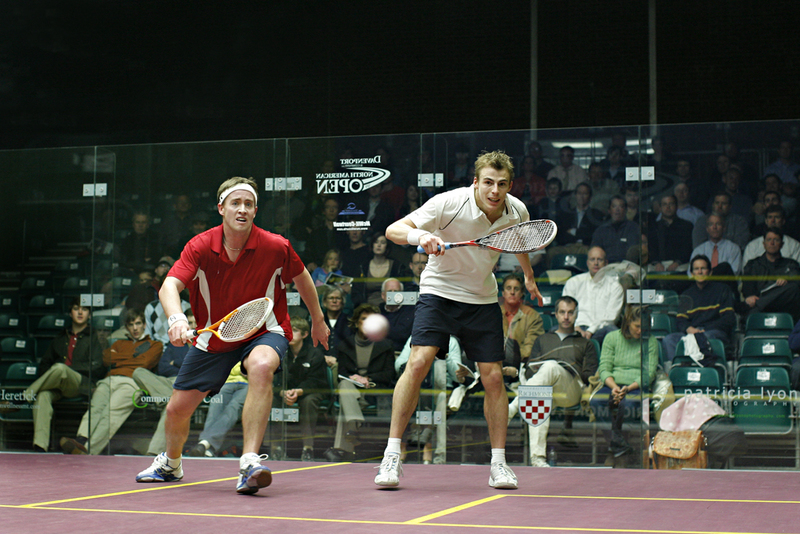 We would like to invite you to point your browsers over to WWW.NAOSQUASH.COM for live coverage of this year’s tournament. With the recent abrupt change in coverage from one website, we wanted to make sure that an outlet for information was available to everyone not attending the matches in person. Of course everyone can watch the coverage live on www.PSALive.com and there are also many other great sites out there covering the action (some wonderful sites represented by the audience of this email), but we wanted to provide fans and media with another outlet of up-to-date information. We have linked our Draw up to the PSALive draw and we also now have a blog being written by our own Whit Sheppard and pictures by our own Patricia Lyons. We want to ask everyone to pass this along to anyone you might know that would find this interesting and/or helpful. If you all have email lists, this too would be wonderful to help us get the word out about this wonderful tournament. We really want to thank everyone for the great coverage so far and we hope you might also find this helpful. Please let me know if you have any suggestions for our site. If I have not already done so then please let me emphasize just how much Everyone here in Richmond really appreciated you choosing and coming to play here last week and how especially grateful we all were for the incredible demonstration of your skill, impressive physical and mental displays along with of course superb sportsmanship shown throughout culminating in an incredible Final match that will be one for the ages and certainly not forgotten here for a long time. I hope that you enjoyed your stay at the Jefferson and will choose to come back again in 2010, for which the tournament organizing committee will start preparing for very soon and has some new ideas - no time to relax thats for sure. Please check out the following link on Thatcher on Thursday on this site if you have not already done so - it is under "Thatcher on Thursday" and then go to 'RICHMOND PICTURE SHOW SET TO MUSIC '. www.patricialyonsphotography.com/NAOSquash2009/ is the actual link but it might be easier to go via Squashplayer - Thank you to Paul and Alan for posting it. Again Patricia has done an incredible job and if you would like to contact her directly for any particular shots or more information then please do at patricia@patricialyonsphotography.com. In, fittingly, the longest match of the tournament, Egypt's Ramy Ashour ultimately prevailed in the Davenport North American Open by beating Englishman Nick Matthew in the 91-minute, five-game final of the $93,000 PSA Super Series Silver squash event at the University of Richmond in Virginia. Ashour, the 21-year-old third seed in his first final since winning the World Open title last October in England, took the first two games in this scintillating climax - and led 5-3 and 9-8 in the third. But Matthew, the eighth seed from Sheffield who is returning to the top flight after shoulder surgery last year, maintained his focus to win the game - then led throughout the fourth to level the match. It was nip and tuck in the decider - with never more than two points separating the pair until the last point of the match when another Ashour drop landed just beyond the outstretched Englishman to give Ashour the title in an 11-8, 13-11, 10-12, 5-11, 11-8 scoreline. At the presentation ceremony, Ashour thanked his opponent and joked that he never thought the match would go so long. "I’m really happy winning this match. I think I’m back on track and have my confidence back," added the 21-year-old from Cairo who now boasts 11 PSA Tour titles, of which seven are Super Series crowns! The runner-up, celebrating his third successive appearance in a Tour final, added: "It was great that everyone got behind both of us. Thank you very much for your support, it made it a pleasure to play." Egypt's Ramy Ashour (left) and Englishman Nick Matthew staged stunning upsets over higher-ranked opponents in the semi-finals of the Davenport North American Open to reach the climax of the $93,000 PSA Super Series Silver squash event at the University of Richmond in Virginia. In the first semi, third seed Ashour came back from 1-6 down in the fifth game to upend the tournament's top seed, his fellow countryman Karim Darwish, 8-11, 11-7, 11-7, 6-11, 11-7 in 74 minutes. Said a breathless Ashour afterwards: "After all this running, I can hardly talk. At times I lost my concentration. It's not always easy to keep my focus on the court." The decider was really a tale of two games. 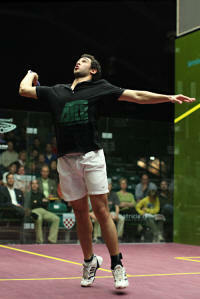 Darwish, the world number one, maintained the momentum from his fourth game win at the outset, racing out in front 6-1. But the 27-year-old from Cairo's movement seemed hampered from that point on - the accumulation of too many long rallies and fully-stretched lunges for Ashour's clever boasts and drops. The younger Egyptian's legs helped Ashour win nine consecutive points to get to 10-6 up - a point away from the win. But Darwish won the next point to get to within 7-10 when Ashour, the 21-year-old world No4, dumped a forehand volley in the tin - before then winning the final point with a forehand drive that Darwish had no answer for. The victory takes Ashour into the 17th PSA Tour final of his career - but the first since October when he beat Darwish to win the World Open title, for the first time, in England. "I was actually thinking a bit about Manchester," added the former world junior champion from Cairo afterwards. "I lost against him last year on this court (in the quarter-finals). I can’t really analyse how it happens on the court — I just do it!" The other semi-final provided sweet revenge for England's Nick Matthew, (right) who avenged his January loss to France's Gregory Gaultier in the final of the Tournament of Champions with a 14-12, 11-9, 6-11, 11-3 win after 83 minutes of high-calibre squash. "The first game was so tough," said eighth seed Matthew of the 32-minute opener that firmly established the fact that he was intent on making life difficult for Frenchman Gaultier, the fourth seed who bounced back in the third game before being distracted by an ongoing dialogue with the referee. "Greg had a few errors that I’m sure he wasn’t happy about. I had to stay focused the whole time," added Matthew, the former world No5 from Sheffield who is returning to the top flight after shoulder surgery last year. Matthew will be contesting his third consecutive Tour final - a streak that includes not only victory in the Swedish Open in February, but later also in the British Nationals. Matthew leads the head-to-head with the Egyptian 3-2 and has won their last two meetings. But the 28-year-old is far from overconfident looking ahead to Saturday's final. "Ramy’s an incredible player. He plays fantastic shots you don’t even see sometimes." 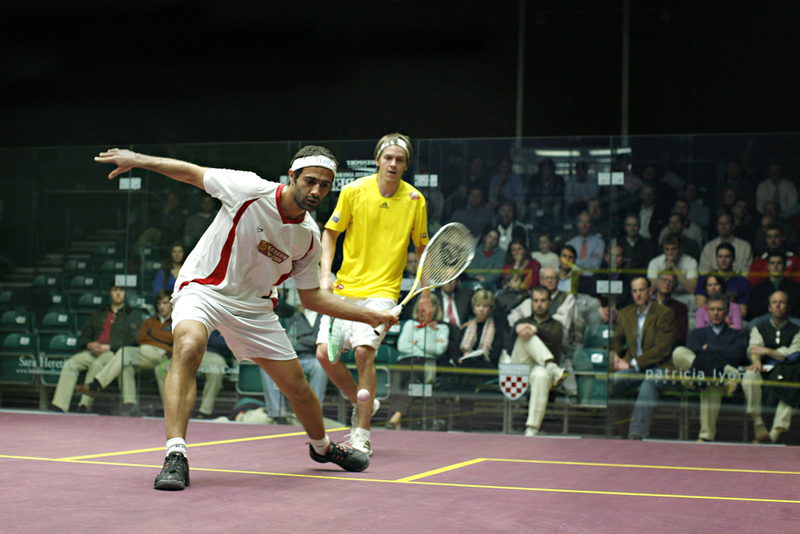 The recurrence of a knee injury sustained earlier in the year led second seed Amr Shabana to concede midway through his quarter-final match in the Davenport North American Open – leaving England’s Nick Matthew to secure an unexpected place in the last four of the $93,000 PSA Super Series Silver squash event at the University of Richmond in Virginia. "Clearly, Amr's not the type of guy to pull out unless something's really wrong," said eighth seed Matthew after his 11-9, 11-7, 5-3 victory in 41 minutes. "We're all striving to be like him... he's won three world championships. I'd give anything to have one of those,” added the 28-year-old from Sheffield who is returning to the top flight after shoulder surgery last year. Shabana, the world No2 from Egypt, injured his left knee two months ago during the Tournament of Champions in New York - and said afterwards that he still isn't feeling 100% and didn't want to risk incurring further injury, so decided to abandon the match. In a repeat of the New York event final, Matthew will take on ToC champion Gregory Gaultier after the in-form Frenchman steamrolled his good friend Wael El Hindi (left)11-5, 11-8, 11-1 in 49 minutes. "It gave me a lot of confidence, winning the Tournament of Champions,” said Gaultier afterwards. “I had 10 hard days of preparation afterwards and I'm playing well again. I had to be really sharp in the front of the court and volley as much as possible tonight against Wael." The other semi-final will be an all-Egyptian affair between favourite Karim Darwish, the world number one, and third seed Ramy Ashour, (right) the reigning World Open champion. Darwish is through to the last four after trouncing former world No1 David Palmer 11-4, 11-5, 11-7 in 45 minutes. The Australian looked to be getting back into the match early in the second game, leading 5-3, but the 27-year-old Egyptian ran off eight consecutive points to race out to a 2-0 lead - then methodically wore down Palmer in the third game to close out the match. Palmer was playing with a wrap on his right knee after sustaining a cut in his win yesterday over Saurav Ghosal of India. Ashour enjoyed a reasonably pedestrian 11-8, 11-4, 11-9 quarter-final win in 36 minutes over sixth seed Thierry Lincou. 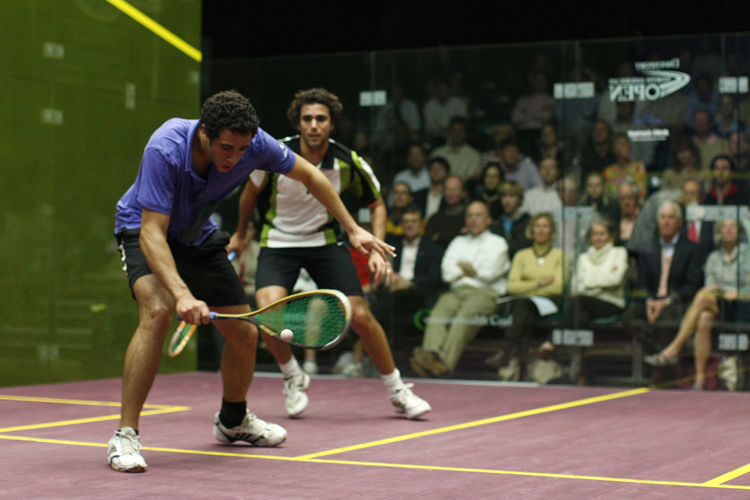 (left) Ashour's blazing court speed and lightning-quick hands were the primary instruments of the Frenchman's demise. "I didn't think about anything at all out there," said Ashour. "No matter if I was feeling tired I just tried to keep pushing my hardest and be keen about every shot." 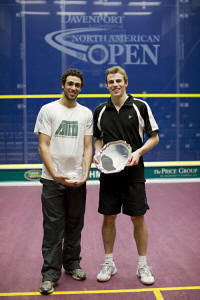 Ashour and Darwish contested last year’s World Open final in England. "It's tough to play him but I'll do my best against him," said the 21-year-old from Cairo. 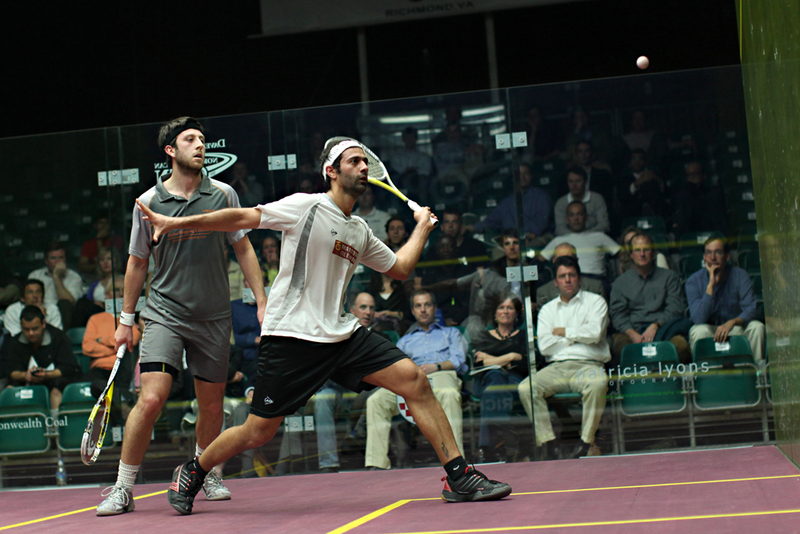 The top two seeds were stretched in the second round of the Davenport North American Open before anticipated finalists Karim Darwish and Amr Shabana (right) took their places in the quarter-finals of the $93,000 PSA Super Series Silver squash event at the University of Richmond in Virginia. Second seed Shabana, the Egyptian who held the world number one ranking for 33 months before compatriot Darwish wrested it from him in January, found himself 1/2 down in his first ever match against Englishman Daryl Selby, the 13th seed. But Selby, the rapidly-improving 26-year-old from Essex who was ranked outside the top 40 when his opponent first became world number one, was unable to maintain his dominance. 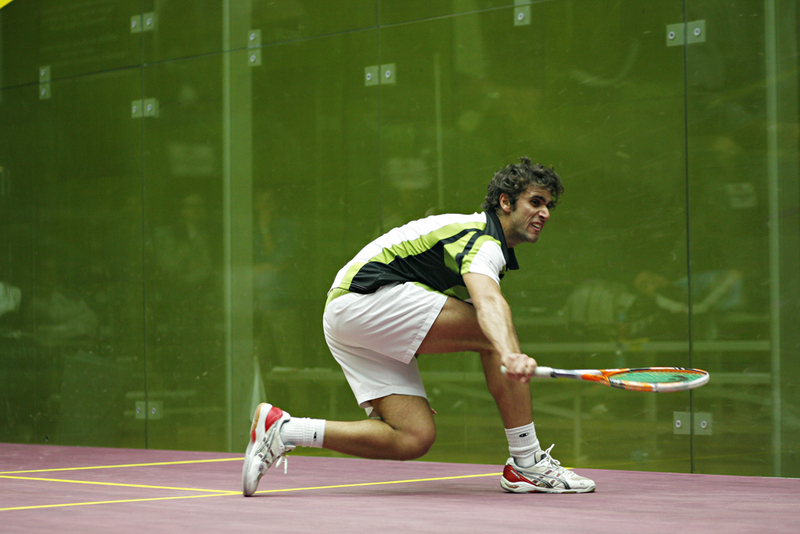 Shabana found his stride in the last two games and, after 71 minutes, clinched his 11-9, 6-11, 3-11, 11-6, 11-5 victory. 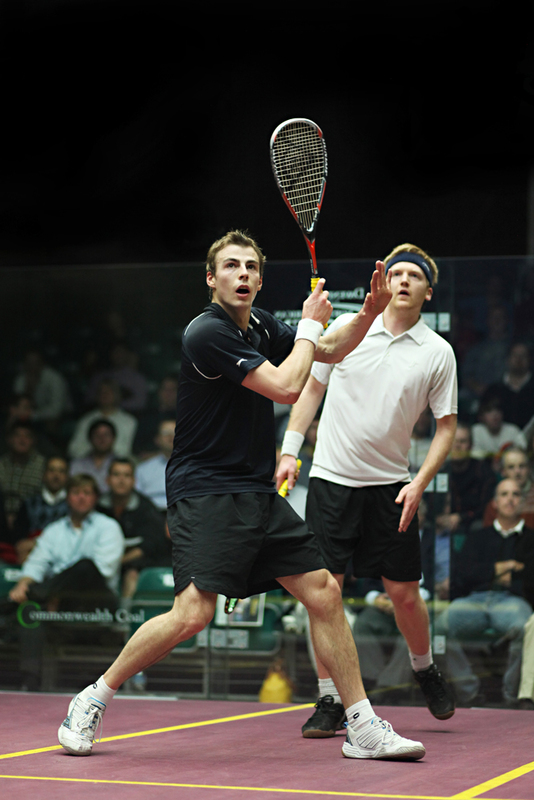 The 29-year-old from Giza will now face another English opponent Nick Matthew, (left) the in-form eighth seed. Matthew, the former world No5 returning to the top flight after shoulder surgery last year, despatched fast-improving compatriot Tom Richards 11-8, 11-4, 11-5. 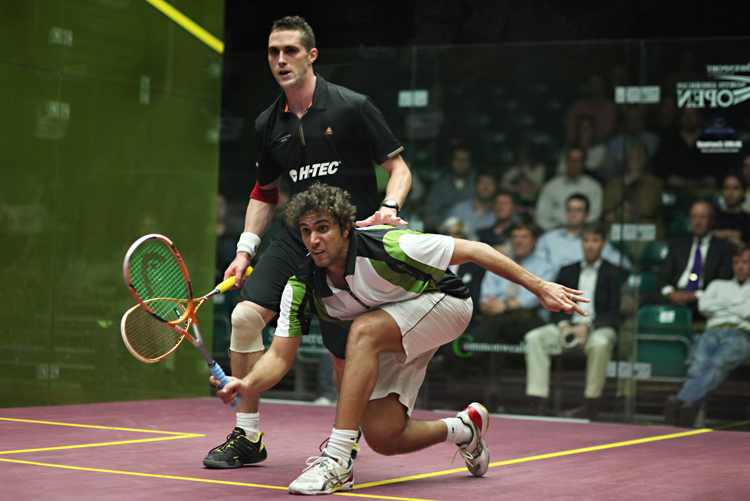 Darwish will now face fifth seed David Palmer, the reigning British Open champion and a two-time World Open champion. The veteran Aussie found his groove after a testing opening game against Saurav Ghosal, the 15th seed from India - but was kept on court for 54 minutes before claiming his 12-10, 11-6, 11-7 win. Palmer is the only Australian left in the tournament after fellow New South Welshman Cameron Pilley failed to upset fourth-seeded Frenchman Gregory Gaultier. Pilley pushed Gaultier all the way but was unable to win the crucial points as the Frenchman emerged an 11-7, 11-9, 11-9 victor. Gaultier, a finalist in his last three PSA Tour events and winner of the Tournament of Champions in New York in January, will be hoping to prevent an all-Egyptian semi-final line-up when he takes on No7 seed Wael El Hindi in the next round. 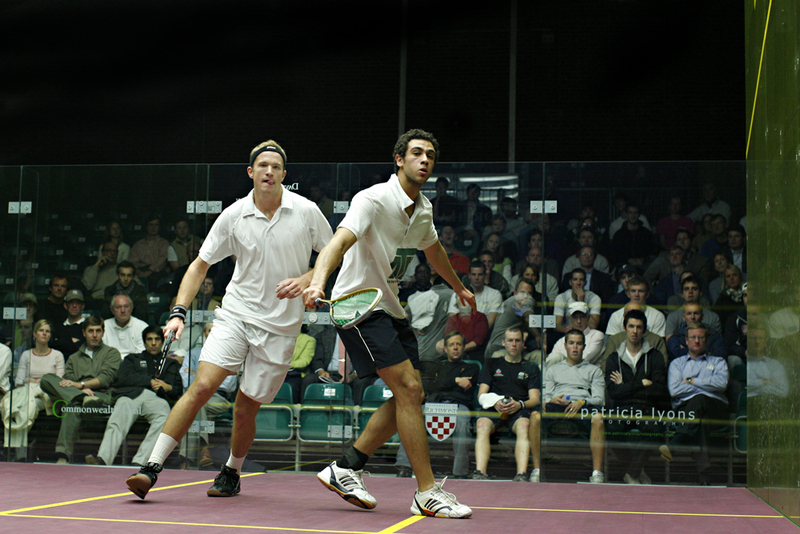 World champion Ramy Ashour (left Black Shorts) was severely tested in the Davenport North American Open as unseeded South African Stephen Coppinger (Left in white) came within points of taking a two-game lead over the third-seeded Egyptian in the first round of the $93,000 PSA Super Series Silver squash event at the University of Richmond in Virginia. The 21-year-old world No4 from Cairo found his form late in the second game and went on to beat Coppinger, a two-time South African national champion, 7-11, 12-10, 11-8, 11-6 in 46 minutes. Ashour will be joined in the second round by compatriot Karim Darwish (right) after the top seed cruised to an 11-6, 11-1, 11-3 win in 23 minutes over Pakistan qualifier Arshad Iqbal Burki. World number one Darwish, who showed no signs of the ankle injury which caused him to concede this month’s Swedish Open final, will now face 14th seed Renan Lavigne. The experienced 34-year-old survived an all-French battle with Yann Perrin, beating the 23-year-old qualifier 11-7, 11-9, 11-5. Australian David Palmer shrugged off a chest infection to down Brazilian qualifier Rafael F Alarcon 11-5, 11-0, 11-6 to claim his anticipated place in the last sixteen. The fifth seed picked up the illness at the Bluenose Classic earlier in the month in Canada and has been struggling ever since. 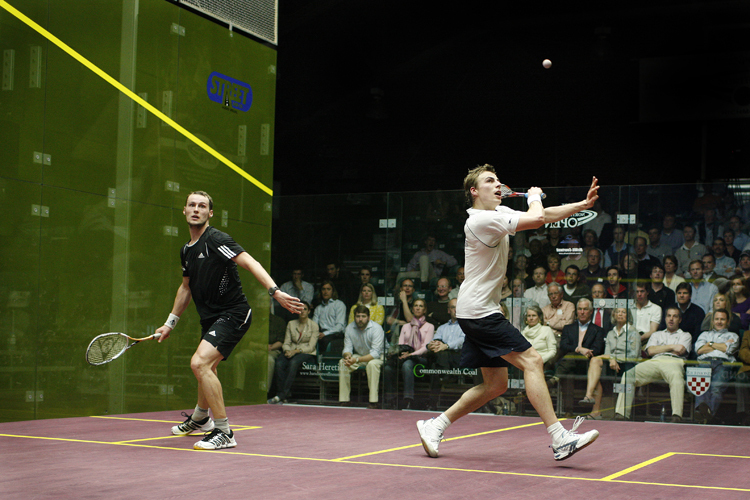 Palmer will now face Saurav Ghosal after the 15th seed from India beat Egypt’s Yasser El Halaby 11-6, 11-5, 11-2. Englishman Tom Richards caused the only upset on the opening day of action in the Davenport North American Open when he outlasted US hope Julian Illingworth, the 16th seed, in a 90-minute first round match in the $93,000 PSA Super Series Silver squash championship at the University of Richmond in Virginia. Just two ranking positions separate the pair – and Illingworth, the US champion for the past four years, was looking to exploit ‘home advantage’ and take domestic interest into the last sixteen of this Richmond event for the second year in a row. The 25-year-old New Yorker led 2/1 – and, after Richards had drawn level, fought back from 4-8 in the fifth game to send the match into a tie-break. But the English underdog, ranked 44 in the world, held his nerve to record a brave 11-8, 12-14, 8-11, 11-9, 12-10 victory. The No8 seed from Sheffield, who beat Irishman Liam Kenny 11-7, 12-10, 11-5 in just 42 minutes, will be facing Richards for the second time this month after beating the 22-year-old from Surrey en-route to winning the British National title. Second seed Amr Shabana (right) was triumphant in his first ever match in Richmond as he fended off the challenge of Jan Koukal, beating the Czech number one 11-7, 11-8, 12-10. The former world number from Egypt one will be anxious to make amends for his second round exit in the Tournament of Champions in New York in January when he faces England’s Daryl Selby for a place in the quarter-finals. Selby, the 13th seed from Essex, had only been on court for 14 minutes when Pakistan opponent Khawaja Adil Maqbool, a qualifier, retired injured with the score standing at 11-0, 11-6. 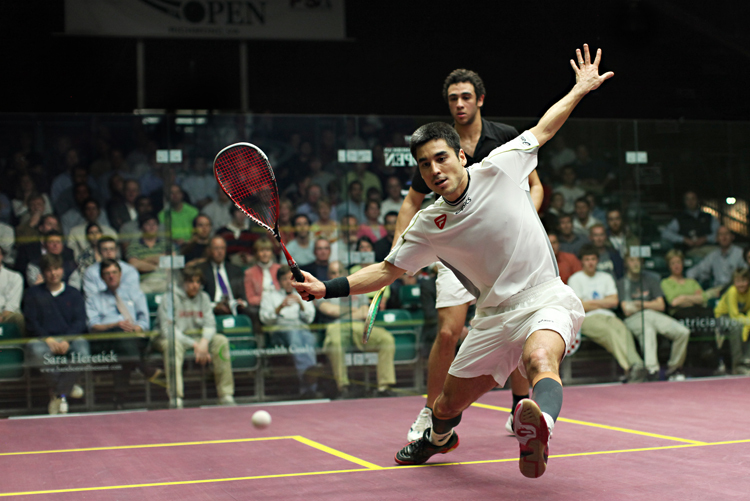 Pakistanis boasted 100% success in the qualifying finals of the Davenport North American Open when both Arshad Iqbal Burki and Khawaja Adil Maqbool secured places in the main draw of the $93,000 PSA Super Series Silver squash championship - the second Super Series event of the year in the USA - in Richmond, Virginia. Burki, 24, from Peshawar, took just eight minutes to earn his place in a Super Series event for the first time in more than two years when his higher-ranked opponent Wade Johnstone, from Australia, retired injured with the score standing at 11-4, 7-2. The lowest-ranked qualifier in the event is unlikely to find the next round as straightforward: Burki now faces top seed Karim Darwish, the world number one from Egypt! Dubai-based Khawaja Adil Maqbool defeated Joshua Greenfield – one of three New Zealanders to exit at the qualifying finals stage - 11-6, 11-8, 11-3. The 20-year-old takes on England’s Daryl Selby, the 13th seed, in the first round. North American interest in the event will also be boosted by two Canadians who prevailed in the final qualifying round – both in 72 minutes! Robin Clarke recovered from a game down to beat US opponent Christopher Gordon 5-11, 11-8, 12-10, 11-6, while David Phillips came from two games down to overcome Australian Bradley Hindle 9-11, 7-11, 11-6, 12-10, 11-5. The second Super Series event of the year has attracted a world-class field led by the top four players in the world rankings – though England’s world No5 James Willstrop, winner of the Virginia Pro Championship in Richmond a year ago, was forced to withdraw with a virus illness. Frenchman Gregory Gaultier, the world No3 who won the first Super Series event of the year at the JP Morgan Tournament of Champions in New York in January, heads the Dunlop PSA Super Series Rankings and will be keen to build on his lead in Richmond. The third seed faces Zambian Patrick Chifunda in the first round and is expected to meet second seed Amr Shabana, the former world number one from Egypt, in the semi-finals. Nick Matthew, the Tournament of Champions runner-up who heads the English assault in Virginia, will also be keen to make up for missing out on qualification for this year’s ATCO Super Series Finals after spending most of last year recovering from shoulder surgery. The world No9 from Sheffield, currently in second place in the SS rankings, faces Irishman Liam Kenny in the opening round.